Crop circles have begun their journey in the 60s and have been popularized by TV shows and by their appearance in the written media. While most of them are harmless and are nothing more than just the product of nights of work by many teams of men who wanted to create a mystery around them, that doesn’t mean that they can’t have a meaning. In fact, most of them have been produced in such a way as to represent the knowledge at the moment of them being created, knowledge about our solar system, about notions such as DNA, our role in the cosmos and a lot of other less easy to read significances. Some of the most mind boggling crop circles have led us to believe that they had to be produced by someone other than human, as they seem to be too well produced and too well organized to be the work of men. In fact, some of them, at closer inspection showed signs of trace radioactivity, which could be considered either a step forward in trying to link them to UFo presence or actually being the product of aliens. 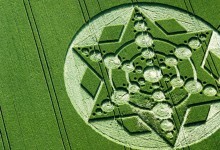 No matter what your position on crop circles might be, one thing is sure, they are works of great intricacy and the fact that nobody has been caught in the middle of producing them still raises some questions as to how some of them were produced. Some experts indeed showed that such circles can be produced by guiding oneself with a system that takes the relative position of stars and the human eye, but the results were always so and so, not too exact, not too far away from what we have come to know from the media. However, the belief that some of them might actually be genuinely alien remains a bit farfetched, given the research that has been poured into them over the years. How Does an Asteroid Impact Make Diamonds? Russia says it's been keeping a huge haul of diamonds—created during an asteroid impact millions of years ago—secret since the 1970s. By Kathryn Doyle Russia recently revealed a secret trove of "trillions of carats" of diamonds, .